Let you smile and let the clouds go. become Mediterranean, let you smile. The local elections held on 31 March 2019 in Turkey produced a result of great significance to the country and its government’s politics of authoritarian nationalism. The promising results have caused jubilation among those desperate to see the end of increasingly repressive rule and, despite the long and difficult road ahead, it signals the potential for serious change. President Recep Tayyip Erdogan’s ruling party AKP (Adalet ve Kalkınma Partisi – Justice and Development Party) lost municipalities of major cities such as Ankara, Istanbul, Antalya, Adana and Mersin to the secular main opposition party CHP (Cumhuriyet Halk Partisi – People’s Republican Party). These are great victories for the CHP that were a long time coming. However, this victory is not only a success for the CHP’s outstanding candidates such as the new mayor of Istanbul, Ekrem İmamoğlu, and the mayor of the capital Ankara, Mansur Yavaș. 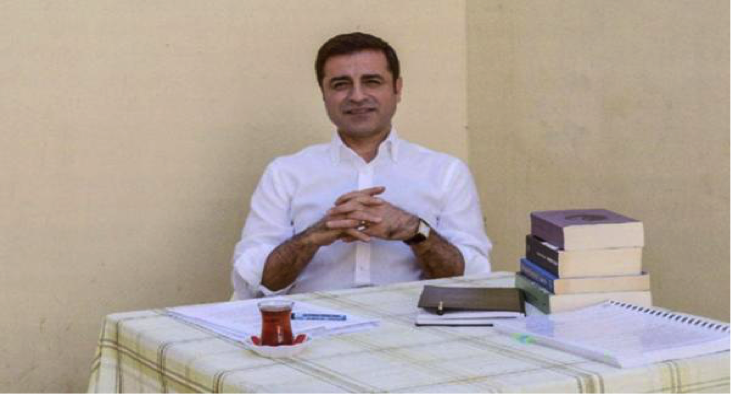 It is also a success for the Kurdish-led leftist party HDP (Halkların Demokratik Partisi – Democratic Party of People) and its imprisoned former co-chairman Selahattin Demirtaş, in particular. Demirtaş called his electorate to go to the ballot box rather than boycott the elections and use their valuable votes to stand against fascism and for democracy and peace. He and Sezai Temelli, the current co-chairman of the HDP, also urged their electorate to vote for the opposition parties CHP and İyi Parti (İYİP) especially in western cities where the HDP did not stand a candidate. This strategy was based on winning in the Kurdish-populated cities and making the Islamist-nationalist AKP-MHP coalition lose in the western and southern provinces of Turkey, where the Kurdish population is not predominant but still strategically effective. Kurds, who are especially restricted in certain Kurdish areas in the east and southeast of Turkey due to state repression, caused the AKP-MHP block to lose in the west by voting for CHP candidates. Although some Kurdish cities such as Ağrı and Şırnak gave results in favour of the AKP, the Kurds voted predominantly for the HDP in Diyarbakır, Kars, Mardin, Batman, Siirt, Van and Hakkari. These results tell us some important facts. First of all, the opposition’s victory owes to Demirtaş’s call for Kurds to support the CHP in the west. Second, the CHP conducted a successful election campaign with good candidates. Third, the ongoing recession and rising unemployment are crucial factors in the election upset. What’s more, these promising results indicate the failure of Erdogan’s polarising, populist rhetoric that claimed that the local elections were a matter of national survival, as well as his attempts to discredit opposition candidates with allegations of terrorism and/or corruption. However, talk of the beginning of the end for Erdogan’s authoritarian rule should be qualified by the fact that Erdogan’s AKP received almost 45 per cent of the total votes across Turkey, while its closest rival CHP won 30 per cent. Since losing Istanbul, which is the most crowded city in Turkey, may mean losing Turkey, we can expect the AKP led by Erdogan to become more desperate to cling on. The loss in Istanbul is also particularly symbolic for Erdogan because he entered Turkey’s political arena as the young mayor of Istanbul in 1994. In addition to Istanbul, the loss of Ankara is critical, because these cities have been ruled by members of Islamist and/or nationalist political parties including the AKP and MHP for decades. That’s why the AKP have recently raised an objection to the election results in Istanbul where the difference in votes between the two candidates, the CHP’s Ekrem İmamoğlu and the AKP’s Binali Yıldırım, were very little. What should we expect to happen following this? The pressure on the opposition may increase, the CHP and HDP municipalities may not be allowed to work properly – they may be accused of corruption and terrorism – and even the elected mayors of the opposition parties could be jailed. This has happened to many mayors and politicians of the HDP. Erdogan and the MHP’s leader Devlet Bahçeli highlighted many times after the local election results that there will be no snap election and the general election will be held as planned in 2023. Erdogan is fully aware of his decreasing public support. Meanwhile, Erdogan’s AKP will try to regain the support and power that they have been unable to get from the public through repression. They will try to discredit and persecute the opposition municipalities and, as soon as they succeed, they will announce a snap general election. We should not forget that fascism is only possible with the abolition of the opposition. But the AKP and Erdogan are not able to break the opposition’s resilience. The opposition, especially the CHP, should consider serious changes to its policies of Turkish nationalism that mainly depends on the denial of the Kurdish question and supporting military measures to end it. This would allow the CHP to break the anti-Kurdish policy of the political Islamist-nationalist AKP-MHP block. This would show their appreciation of the Kurdish people’s electoral support. It would also confront the fact that we will not see a fully democratic country until the Kurdish question is peacefully resolved by negotiated settlement. Dr Bermal Aydin is a postdoctoral visiting researcher based at the Centre for the Study of Human Rights at LSE. Her research interests include alternative media, gender representations in media texts, resistance and its means, authoritarianism and populism in the Middle East, especially in Turkey.